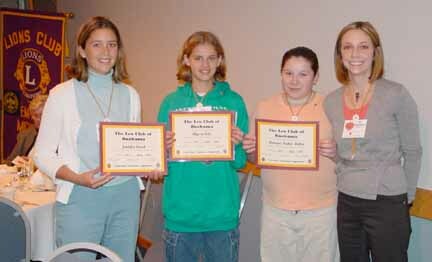 Jennifer Couch, Alyssa Cole, Autumn Miller, and Cali Scheppelmann, Club Liason, proudly display certificates of official membership in the Leo Club of Onekama. 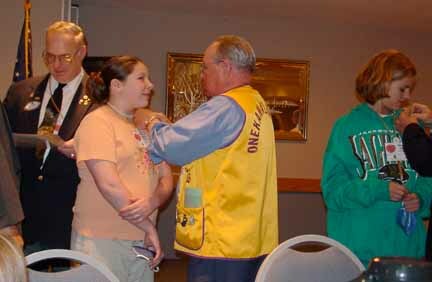 Members of the Onekama Leo Club attended the Lions International District Convention on Saturday, April 20, 2002 in Traverse City, Michigan. During lunch ceremonies, Peter Cerniglia, International Director of Lions Clubs, officially installed new Lions, Lioness, and Leo members. As part of the induction, attending members of the recently founded Onekama Leo Club were blindfolded and led into the room guided by sponsors from the Onekama Lions Club. 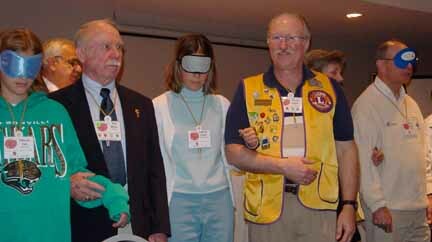 After repeating a vow of allegiance, the blindfolds were removed as Dan Gibbons, District Governor, presented participants with pins and certificates. "The Lions have been very supportive of us this year while we struggled to organize and find opportunities for our new club. Im glad we were invited to this induction because it really made me feel like I was part of the group," stated Jennifer Couch, club president. Alyssa and Jen, escorted by their Lions Club sponsors, listen carefully before repeating vows of membership.